Today I am sharing a 3D Swing Card that I recently made for my Stamper’s Club. My theme for January and February classes is Cards that Move also know as Fancy Fold Cards. This is one examp le and actually not too difficult to make! After demonstrating this card at my Stamper’s Club, I promised that I would record a video on how to make these cards – so HERE it is! This card is made using the Bloomin’ Love stamp set and the Love Blossoms Designer Series Paper Stack from the Stampin’ Up! Occasions catalog. The cardstock is Rose Red and Whisper White with Rose Red ink. The frame is cut using the Deco Labels framelits. Cut a full piece of Rose Red cardstock into quarters to 4 1/4″ x 5 1/2″. Cut 4 coordinating pieces of Designer paper to 4″ x 5 1/4″ and attach to the front of the cardstock. Score and fold each piece at 2 1/8″ the long way. Stamp the Heart from the Bloomin’ Love Stamp set with Rose Red ink on Whisper White cardstock 4 times. Cut out each heart and score down the middle of the heart. Attach one folded side to the folded side of the 2nd heart. Cut an 8″ piece of Baker’s Twine and place thru the center of the heart. Add the next folded heart with the baker’s twine thru the center. Using Fast Fuse, add adhesive to half of one side. Line up the next piece and secure. Add adhesive to half of the 3rd piece and fold back. Repeat with the 4th piece. Add a little fast fuse to the folded seam of the card. 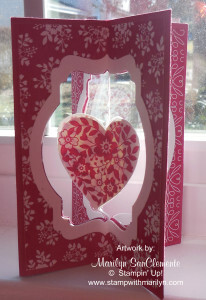 Lay the 3D Heart with the baker’s twine to the center of the card. Add adhesive to the last side and seal the card! Check out my Video on You Tube HERE.